President Rafael Correa tried to save the world’s most biodiverse forest, the Yasuni National Park—but rich nations ignored his offer. The tapir, dark brown and the size of a small cow, had been shot in the head and floated away dead before the hunters could retrieve it. Now the man at the helm of our outboard skiff, traveling up a muddy Ecuadorean river in the Yasuni National Park with some scientists from the Tiputini Biodiversity Station, has spotted the freshly killed animal. A couple kilometers further upriver, we pass a hunting party of Indians. They have new clothes; one of the men wears a big watch; a woman in their party has a bright yellow dress; on their canoe sits a big new outboard engine. These are all signs that they are not local subsistence hunters, but outsiders in search of illegal bush meat to sell in the towns. As we glide by, the Indians smirk condescendingly at the worried conservation-minded scientists. This is how jungles die: one tapir at a time, bit by bit, nibbled away by poachers, settlers and illegal loggers. Yasuni is scientifically determined to be the most biologically diverse place on earth: researchers here even discovered a fungus that can digest plastic. But Yasuni sits atop a large part of Ecuador’s known petroleum reserves, and that means this global treasure is under dire threat. For a time, the effort to save Yasuni appeared to have a real chance. In 2007, at the peak of a recent wave of global concern about anthropogenic climate change, Ecuador’s left-wing president, Rafael Correa, promised to keep 20 percent of the country’s known petroleum reserves—an estimated 846 million barrels of Yasuni’s Ishpingo-Tambococha-Tiputini (ITT) oil field—permanently out of reach…if the international community would contribute at least half of the revenue that Ecuador could earn by extracting the oil (about $3.5 billion). Donations were held in a trust fund operated by the United Nations Development Group and used to finance alternative energy projects like wind and solar. The fund needed to raise only $350 million a year for the next ten years. And the plan was seen as a possible model for other developing economies wishing to escape dependence on oil exports. Like the Keystone XL pipeline, Yasuni is something of a global test case for the climate-activist rallying cry of “Leave the oil in the soil and the coal in the hole.” If humanity cannot manage to refrain from drilling for oil beneath the most biologically diverse place on earth, then how can we expect any state or community not to drill for oil beneath barren desert, degraded farmland or on the ocean floor? Now the jungle here will likely be destroyed, not necessarily by oil spills but by the larger economic reverberations of petroleum development. First will come the oil prospectors, and with them roads. Upon the roads will come hunters, loggers, miners, drug smugglers, settlers, ranchers and thus deforestation. Across the planet, other bad signs are converging. Global emissions continue to increase. The massive fracking-led natural gas boom has driven energy prices so low that many wind and solar projects are no longer economically viable. And a recently leaked draft of the Fifth Assessment Report from the Intergovernmental Panel on Climate Change (IPCC) warns that global sea levels could rise more than three feet by the end of the century if emissions continue unabated. As if that wasn’t bad enough, many scientists say that the IPCC is once again being too conservative. Michael Mann, director of Pennsylvania State University’s Earth System Science Center, told the Huffington Post that sea levels could rise six feet by 2100. The Waorani first met the modern world thanks to oil. In 1937, Shell started prospecting in Waorani territory. But the Indians resisted—killing workers, burning and looting oil camps. For many years, they effectively kept the company out. In 1956, a group of evangelical Christians from the Summer Institute of Linguistics attempted contact, but the Waorani killed them with wooden spears. By the early 1970s, missionaries had converted some Waorani. Around that time, the Tagaeri clan separated from the rest of the Waorani and fled deep into the jungle. In 1987, two Catholic missionaries working with local oil firms, Monsignor Alejandro Labaka and Sister Ines Arango, tried to meet the Tagaeri and convince them to allow oil company personnel to enter their territory. The missionaries were found dead, full of spears. In 1993, two adventure tourists disappeared in the same area. There is still occasional trouble. In 2008, an illegal logger was speared to death while stealing trees, and there were unconfirmed rumors of a massacre of anywhere from five to fifteen Waorani. Closer to the research station, along a road built by the Spanish oil company Repsol, are Waorani who, after being contacted in the 1970s, now live in settled communities and survive by a mix of farming, hunting and day labor for the oil company. Far from being the noble savages of Western fantasy, the Waorani along the Repsol road range from hard-working mothers to young, progressive college kids (I met one who wanted to go study in Cuba), to angry old quasi-bandits who resent the scientists as much as the oil company. Diego Mosquera, manager of the Tiputini Biodiversity Station, knows these people well. Part of his job involves a weekly trip bringing the station’s garbage out and its supplies in. Frequently, a group of Waorani men associated with a tough old warrior named Nambea stop Mosquera on the road and demand tribute. We can read in the Waorani’s threats a measure of the real stakes involved. Though Ecuador’s oil is not massively important to the world—it produces some 500,000 barrels a day, about the same as Australia or Thailand—the oil is important to Ecuador. The country only has a “B” credit rating and thus pays high interest rates. This is partly the result of a “selective default” on $3.2 billion in foreign debts, which Correa declared “illegitimate” in 2008. Against this backdrop, financing development with oil revenues is all the more alluring. Meanwhile, 27 percent of Ecuadoreans live in poverty, with many of them going hungry; as the World Bank puts it, they are unable to “meet their nutritional requirements even if they spend everything they have on food.” Many of the Ecuadorean poor are well organized and militant, and they protest vigorously with mass marches and roadblocks. 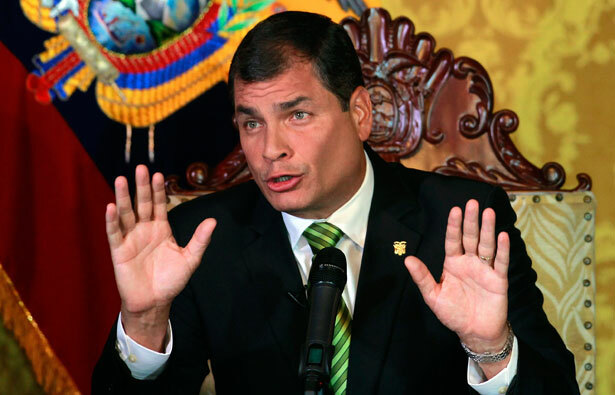 This puts heavy pressure on Correa from the left to deliver services and thus increase state spending, though the same forces tend to oppose exploitation in Yasuni. The Ecuadorean economy needs a more equitable distribution of wealth, but it also needs investment and jobs. The state needs revenue to fund its expanding experiment in poverty reduction and tropical social democracy. Under such conditions, it is hard not to drill for oil. The country’s proven oil reserves of 6.5 billion barrels could underwrite all manner of future development schemes. As OilPrice.com puts it: “Oil brings in a dependable cash flow and prices remain near historic highs. If Ecuador can return to its previous, higher levels of oil production it would be an easy guaranteed growth opportunity.” No wonder the Chinese are set to help finance a $12.5 billion oil refinery in Ecuador. Unlike the Waorani on the Repsol road who threatened to “burn down” the research station and “kill all your monkeys,” the government of Ecuador asked politely and argued reasonably. Yet the rich nations ignored the Yasuni initiative—and if they continue to fail to mitigate carbon emissions and build out a new carbon-free energy economy, it’s not hard to imagine a scenario in which the world does essentially “burn down,” killing all of the monkeys—even the very clever ones in business suits.